Registration for the 2018-19 Spring Sports Season will open on November 30th @ 8am & will close on January 24th @ 3pm. Late registrants will not be cleared to tryout/practice until Monday, Feb. 4th. NO EXCEPTIONS. Students are required to have a Medical Clearance Form signed by their doctor after July 1st (June 1st for Football). Any Medical Clearance Forms dated before July 1st (June 1st-Football only) will not be accepted. The Medical Clearance Form is good for the entire academic year. Click the blue "REGISTER NOW" button. Find the program for which you would like to register and click on the link. Once in the registration form, complete the information requested. Do not forget to upload your completed Medical Clearance Form in the "Participant Information" Section (REQUIRED). All fields with a red* are required to have an answer. Review your registration summary. Click the green "SUBMIT" button after reviewing your registration summary. 2. On the next screen, click on Proceed to Payment to be directed to PayPal, the payment processor. 4. After you click Pay, you will receive a completion email from PayPal confirming your payment. If the online registration process is not completed by the deadline, athletic clearance will be delayed for up to 7-14 days. Students cannot tryout for any team until the athletic office has verified the student’s scholastic eligibility. Already played a sport this year? 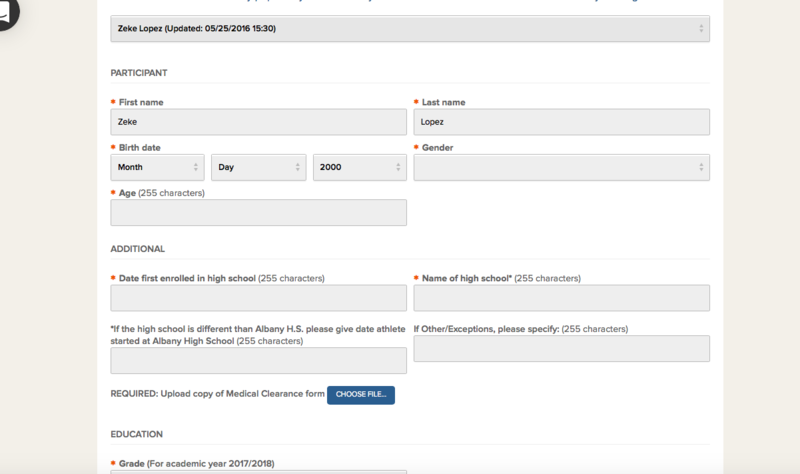 If you have already participated on an AHS sports team this academic year, you still need to log-in to your athletic clearance account and add an additional clearance for the sport you would like to participate. Please be sure that your medical form has been uploaded to your online account. Forgot to upload your completed Medical Clearance Form when you submitted your registration? 8. Scroll down to bottom of screen and select "SAVE & CONTINUE"